In Today’s technology fueled World owing a business has become more difficult in comparison of what it was around 10-20 years back because in today’s scenario,Every business owner needs to create and maintain a website so that to survive and to successfully run their business (be it a small business or a big one) in this competitive world. If you are a small business owner you may not be so familiar with the terms SEO and Local SEO. The acronym SEO stands for Search Engine Optimization, which determines the visibility of your website on the Search Engine Result Pages (SERPs) of some major search engines, for example: Google, Yahoo, Bing etc. Being a business owner you need to let Google know where your business do actually locate and what kind of product or services you are offering, which not only helps you to come more frequently on Search Engine Result Pages (SERPs) but it also helps you to come in front of the eyes of more potential and relevant customers. Many business owners do not pay very much attention on the Local SEO of their website but Local SEO is very important for the people owing small businesses because it helps them to reach to their local customer base. In fact not paying attention on Local SEO can make you leg behind to your competitors. Let us now talk about what Local SEO actually is and the common mistakes which people make in Local SEO. Local SEO is more or less just like the organic SEO, but in Local SEO a specific geographical component is added. That means you are aiming to rank higher in the search engine result pages of the Local Searches. 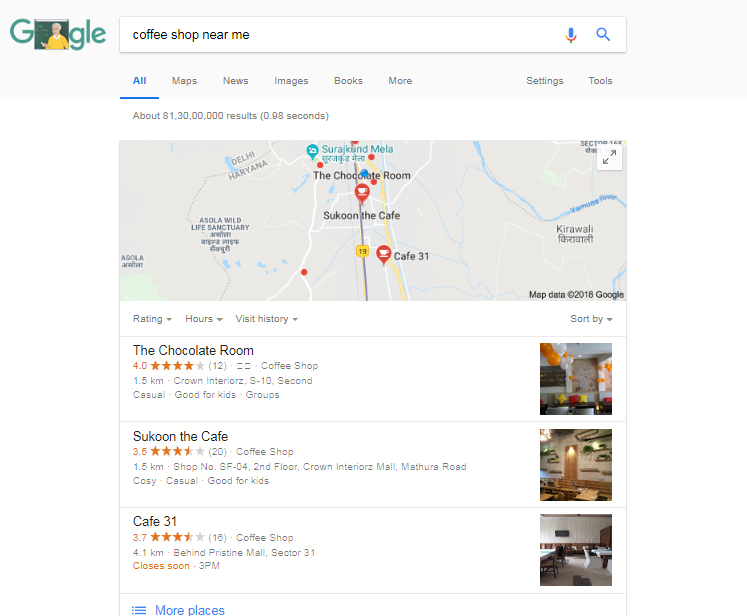 Because there is no mean to rank higher for the searches of best coffee shops in noida, but you actually locate your coffee shop in south delhi. So it is a very effective way to promote a business according to its geographical location. • Local SEO helps in Fast Expansion of your Business. The main part of doing Local SEO is to make sure that Name, Address and Phone numbers (NAP) should be mentioned properly, so that it becomes easy for your customers to visit to your business and to get connected over calls. We have talked in the above section about the Local SEO and its benefits for the business owners now let us talk about Common Local SEO Mistakes. When you search for "nearby products or services”, the result includes a big map at the top right corner of the search result page, and the main section also shows the NAP information (name, address, phone number) of the products/services being searched. These businesses are included in this section are based on their Google+ Local Listing page or from their Google My Business Profile page, not because of their website’s SEO. So if you do not yet have a Google My Business profile page yet. You can set up it any time as It is 100% free to set this up and shouldn’t take more than 20 minutes of your time. Don’t forget the very last step which is to verify your business listing. That’s an important step to ensure you’re the owner of your page so you (and no one else) can make edits in the future. If your website is having a thin content and with low quality then it will become difficult for your website to rank higher in Google search results. Because it is mainly your website which influences that how well your Google My Business page will rank in search result. So it is very important for review all your website’s main pages and make sure each of them at least have more than 500 words of content and that too relevant. As we have already written above that it is very important to have your business name, address and contact number on your contact page and that too in the form of texts not as an image. This fortify that Goggle can easily read this contact information and verify its accuracy. Google also compares your contact details with the details mentioned in the Google+ Listing page, so make sure both the contact information should be exactly same. Because Google doesn’t want to show wrong or incorrect information in their search results, it would be highly destructive for Google’s credibility and over the time they could be losing their users. Google Priorities the websites with reviews and if your websites is having no customer reviews then it would become difficult for you to make your website rank on Google. It is not very easy to get reviews on your website because it takes time and efforts at the customer’s end. But what can you do to get a review from them is to ask them in person or by calling them or via emails. You should make this process as easy as possible for them so that it consumes customers’ lesser time and effort. From these 3 methods mentioned above emails are the most effective way to get the reviews and you also should make sure that your email contains a link of your Google+ profile’s review page so it takes lesser efforts on the client’s side. It may take time to get more positive reviews but with the time being you will end up having more positive customer reviews. Having high quality and relevant back links is the best way to convince Google that you have a relevant and reliable website and deserves to be included in local search results. That means you just can’t rely on a properly optimized Google My Business page and proper citations but you need to make efforts to get more High Quality back links. The best way to get good and relevant back links is to publish great content on other high quality websites and promote them. It may sound difficult to you but to get other websites to link to your website is to create something worth linking to, is the best way of doing this. As we have already mentioned above that Google Compares your NAP information on your Google My Business page and on your contact page of website. But that’s not all. Google in fact compares your NAP information on your website versus information listed on all the other websites over the internet. That means you must have consistent NAP information on every single webpage on which you have listed your contact information. Mainly we are talking about business directories, because these are the websites which shows your contact information publically online. A citation basically means to mention you NAP on other website and we also have mentioned in the #6 that why it is important to have consistent citation on all other websites. But consistency is not the only factor in citation but you need to include all the important information in your citation also. Because it is possible that if something important is missing in the citation then it may harm your chances of ranking higher on Google. To check if you are missing some kind of citation you can start using Moz local search tools. If you find there are some chances to add something else then put all the information of your business there. When you look for the keywords on which you can make your website rank higher, you must make sure that you have done the proper competitive analysis. By studying the 5 top competitors in your niche, you will learn what will actually work, what the targeted keywords are and what kind of back links you need to rank for each term. There has been a lot of debate about this but no one can deny that social media activity is one of the many signals that Google uses to rank websites. Promoting your blogs or web pages through Facebook, Twitter, Instagram, and other social media platforms is a great opportunity to create more exposure of your business. As we have mentioned above, the best way to get good links for your website is via great content. And next it comes that one of the best ways to promote your content to reach in front of your targeted audience is via social media. Local SEO and mobile go hand in hand as more and more people are using their mobile phones in today’s world to search for local business on the go. And as most of your prospects are using mobile devices to search you then it becomes necessary to have mobile optimized websites. Google also has announced recently that they are moving to mobile first indexing, which means that the mobile friendly websites will be the primary websites analyzed and ranked by Google. So if you are currently not having a mobile friendly website then you need to create it as soon as possible in order to compete in local search results. Local SEO involves making some small still significant changes to various areas of your website. And these efforts when combined with main optimization techniques, then it will have a strong impact on your target audience. It also have a great impact on your general performance in the organic search Results. How SEO will be a helpful in turn around of your business?